They're back!! Last fall shortly after I bought my house, I was being over taken by ants. I sat out traps but they really didn't work. Then winter happened and the ants went away. I didn't give them another thought until this week. I had sat a bag of dum dums on the counter and before I knew it they were swarmed. I found a recipe on Pinterest but tweaked it just a little. Yup that's it. I found the Borax in the cleaning aisle. It was with the laundry detergent. 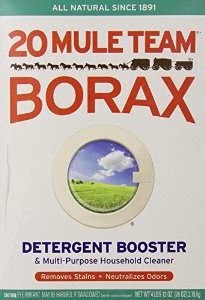 After you make the ant killer you can use the borax for its intended purpose a laundry booster. I used a plastic storage container. Combine 1 cup of Sugar half a cup of borax and just enough water to make it runnier than a paste, but not completely dissolved. Now soak a cotton ball in it. Set it out on a piece of paper or scrap cardboard, anything to protect your surface. The ants will be attracted to the cotton ball and by the next day you shouldn't have any ants. Just throw the cotton ball away after the ants have disappeared. I keep the mixture stored just in case any come back, but its been several days and I've only seen the random ant. "Combine 1 cup of water half a cup of borax and just enough water to make it runnier than a paste, but not completely dissolved"
Err. Did you by chance mean one cup of sugar, there? You have water twice. oops! yes I did, thanks for catching that. I saw our first ant the other day! So I'll probably be making use of this. We've tried ant poison in jelly before, and that seemed to work pretty well, but sugar water is easier - one less ingredient to buy! The source link says its 12 but I think I paid 4 for the box and didn't even put a dent in it, I've been using it for laundry too. Wow! That's a great idea. I'm going to try this. During the summer we get ants really badly in the kitchen. Ick we get ants too. I'll keep this in mind! I'm considering trying this for the kitchen, and did a little research. Apparently it's *mostly* safe if used correctly, but the stuff's still an ingestion hazard for small children and pets. There's also some evidence that prolonged exposure can cause respiratory problems for cats. Soaking the solution into cotton balls probably mitigates a lot of that, but it's still something to keep an eye on; especially if kitty starts showing an interest in them. I read that too. I hid the cotton balls when I say them out. Then after a day when the ants are gone I throw the cotton ball away.